I have to say I haven't been more excited about a book in a while than this one! 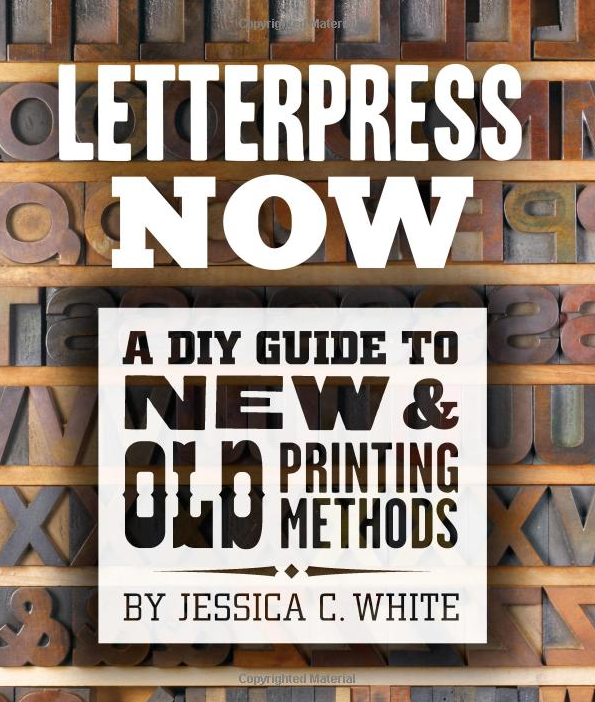 Letterpress Now, a DIY Guide to New & Old Printing Methods by Jessica C. White is really something special if you're in the same thought process as I, totally in love with the letterpress, but were maybe a little confused as where to start. I absolutely LOVE this book as it basically explains everything you wanted to know or maybe even didn't know you wanted to know about letterpress, from deciding on what type would be good for what you need, purchasing one, all the equipment (safety and otherwise) needed to run one and then a heap of awesome projects to make or be inspired by. I have had a few letterpress lessons in my day, but really, to have a book to guide you - and not only guide you but then show several different projects and how to make them from letterpress pros such as Hatch Show Prints, Blackbird Letterpress and more is such a treasure. Jessica White, co-founder of Ladies of Letterpress knows her stuff and does an awesome job laying it all out sharing all the information you need to get started in the letterpress world, whether it's a hobby or perhaps a more serious business venture. The book is available through Amazon here and is published by Lark Crafts who also sell it at their site here. And hooray! We have an extra copy to give away here this week! If you're interested in the giveaway, please leave a comment here at this post why you think you deserve to a copy - and we'll pick a winner by Friday, January 11th! Tweet it and come back here to leave a second entry - with the link to your tweet. Deadline to enter is Thursday evening 9pm Pacific time on January 10/13. No Anonymous or Unknown commenters will be eligible unless you leave a valid email. Best of luck to everyone! I always loved letterpressing in my studies. It would be great to find my way back to letters and typography with this book. It would add to my graphic design studies and emphasise my skills on typesetting. It would also help me to better understand the printing process, therefore be able to better create designs for print! And I deserve one because.... I'm awesome!? Wow, what a great giveaway. Any inspiring book is worth having as they always set your ideas in motion and juices flowing. I'd love to win this one as I'd finally understand how to go about these things..... I only see the end results everywhere but have no idea how they are done. I love this giveaway! I love letterpress but know nothing about it yet... I do hope I win this book, so I can learn! What a great book and perfect timing! I am a graphic designer and have recently started teaching Printmaking at my cities university. I found an old C&P (hidden by dust mostly) and am TRYING to restore it for the kids before the end of the term. They are chomping at the bit to get their fingers on it and I am googling 'how to adjust platen bolts'. This book is just what we need! This would be a great addition to my bookshelf because I am a student studying graphic design and the fine arts, and I've often contemplated going into printmaking. I even did my high school graduation announcements in letterpress on a home built press and a polymer plate. Great giveaway! I am doing linocut wedding invites for my sister's wedding and I love to make hand-carved stamps. I would LOVE to learn more about printmaking in general. Thanks for the chance to win! Great looking book. I would like it because I have access to a letterpress that I am itching to learn on. Yes,what a giveaway! I'm going to take part in old-fashioned letterpressing course in the end of Jan. and I have no idea how it's done so this would be a good chance to read and learn before I attend the course. Then I could learn much more in that course. I sure need and want to learn so much more about letterpress! It would be a blast to win such a book! Best os lick to us all! thank you for posting this! the book is a must have for me. We specialize in flat printing currently, but my husband is a typophile and we are both obsessed with all things old press lettering. I would love to win this book to give to him. Letterpress is something he would love to do. He has already done research but this will give him even more info to get started and find his press! I just adore well made typography and with this fantastic giveaway I could make my own and it would even be made analogously! Oh what a wonderful book! I'd love to win it because my Grandfather was a printer and I still have some of his letterpress letters - I'd love to learn how to print with them. You cannot beat the glorious action of the press and the texture of a great cotton paper filled with vintage typeset images! All your senses are in play with letterpress! I should be most appreciative to be the recipient of such a wonderful book! As a graphic designer, i absolutely adore anything printed letterpress and love that it is being kept alive and is really an art form. I have wanted to learn to letterpress for some time now. I think it would be a perfect addition to my graphic design business. Thank you for the opportunity! Oh hello lovely book! Buying myself a press soon and this book would really come in handy! I'm a graphic artist who was recently left a C&P press by my late uncle, and I have no idea how to use it. This book would be a great resource! What a great book! It's a must have to my wishlist! I have had a small letterpress sitting in my basement that my father gave to me after rescuing it from a museum that didn't want it. I cleaned it up, and would love to use it, but have been at a loss about how to go about that for over two years, so there it sits. This book would help me give that press a new life! Major type geek here. I also dream of creating pretty stationery and cards with a press. This book would be a great resource. I'm in love with all things to do with type, printing and stamping, so I'd love to win the book. I work in a newspaper and have heard stories about the days when we used type and typesetters. Would love to relive those old days! This looks exactly like the kind of book I was searching for! Thanks for finding it! I am a graphic designer who is trying to start her own stationary line. I am currently working during all hours beyond my 9-5 job and I am hoping to expand to offering letterpress solutions. This book would be a great tool to help propel my side business forward. Please strongly consider choosing me. Thank you for the chance at such a great give-a-way. I'm a graphic designer and become a lover of letterpress when I was introduced to it in college. I recently moved to Wisconsin where I discovered the Hamilton Wood Type Museum, an incredible museum with the world's largest collection of wood type and letterpress machinery. Unfortunately, the museum has recently been told they have to vacate their current property and need donations in order to fund the move and maintain the collection. A book like this would be great to have in order to teach friends about the art of letterpress and why it's so important to support a gem like the Hamilton. PS. I'm not affiliated with the Hamilton, I'm just a huge fan of the museum they run and they're mission to preserve the art of letterpress. This looks like a lot of fun! Thanks for the chance. i just LOVE the printed word. even more so when it takes on a tactile quality or added dimension like for example.. 3d signage lettering. especially when a lot of love went into the making of it! this giveaway is just so timely! just last weekend i came back from a trip to the UNESCO heritage sited town of historic Melaka (in my home country of Malaysia) upon learning of this little known printing press shop that is on a quest to revive & reinvent itself after 4 generations of existence. i never knew! flashback to 2 years ago. i was visiting Melbourne & chanced upon the Melbourne Museum of Printing. i was so keen to see what i could learn from there but alas, they were in the midst of relocating. imagine. relocating this HUGE collection of old print press equipment. i decided to volunteer with the move. to the outer suburbs of Footscray. & learnt what i could along the way from the warm affable owner/founder of the place.. Michael. i helped move for about 2 weeks. no small feat i must say. forklifts were involved. many dusty pigeon pooped warehouse-type storage places too. along the way.. i learnt to use the pallet jack! but then it was time to head home to Malaysia. & the move was barely half completed. & so i didn't get to fully learn the ropes from michael the art of the press. i was sad.. but i vowed to go back & pay Michael a visit again. fast forward to present time in Melaka. i naturally jumped at the chance to tag along when my photographer friend was doing a shoot of the lil printshop place! suffice to say i was starry-eyed & head-over-heels in love with the place. i made a new friend in Soon Wei. the great grandson of the original printer who brought the printed word to Melaka. he now helms the business & has bright & beautiful plans for his lil print press shops future! i predict i be paying his shop lotsa visits! my interest has been jumpstarted & ignited again by the the Royal Press. winning this book will mean i get to keep all my cogs well greased & running. creative juices flowing. etsyshop on the brink of opening. then pay Michael a visit again & share the news! he be so ecstatic too. i would love to help keep this art & heritage alive in Malaysia in amy little way that i could. I own a small stationery shop and absolutely love letterpress! Recently I've been given the chance to "borrow" a letterpress that is just in storage to decide if I want to buy it or not. I have no idea where to begin so this book would be awesome! So please help give my ideas some wings! I took a letterpress 101 workshop where I printed using letterpress wooden blocks on a huge 1890's letterpress machine. I would love to win this book to learn more about new and old methods of printing. It is very interesting and exciting! 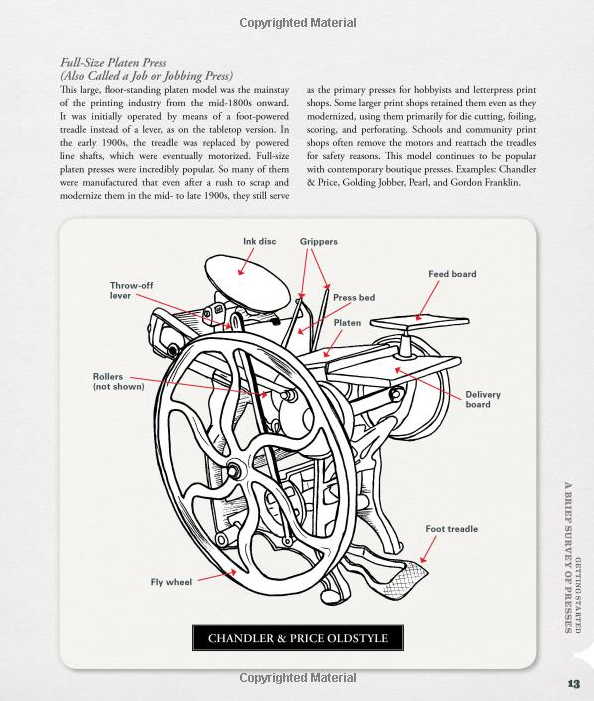 My husband and I are self-taught letterpress printers, and we'd love to have such a well designed guide on how the whole process works. We recently purchased a tabletop cylinder proof press with the hope of printing posters, but haven't been able to get useable results yet. I have always liked letterpress cards/etc and never really thought it was something I could do. But I think this is an art form I could really get into if I had the right tools. I would love to win this book and teach myself! I would love this book and use it till the spine falls apart. My girlfriend and I are purchasing our first letterpress and I can't imagine anything more perfect to help us get started. What a wonderful giveaway. My good friend has a flat bed press in her basement. This book would be an amazing tool to have on hand! I plan to letterpress my wedding invitations. I've taken some classes, but it looks like this book would be very helpful for making sure I get things right! I'm a graphic designer who is really interested in the letterpress & I'm wanting to move my business to the more handmade. My husband surprised me for Christmas this year with a small press that he is redoing so I can practice. I just wish I knew what I was doing beforehand! Would really love to use this book... sound perfect. This book looks really great. I'm teaching graphic design and my students are saying I'm only thinking about Typefaces. They say I even dream in Typefaces! Maybe this will let them understand WHY typefaces are so important & beautiful! Great timing! I bought a Showcard Signpress out of college (15+ years ago) and have never used it. Planning to bring it back to life this summer. This book would be a great resource! In these days of easy digital printing it's fun to see printing methods that used to be and that are really hand crafted. This book looks amazing. Always wanted to learn about letterpressing. I took a letterpress course once and absolutely loved it! I want to get back into it again. and just knowing that a craft person's hands were engaged..
Oh how awesome!! I would love a copy of this book because I'm on a search for a new creative hobby and I would love to try this out! I'm a college student who is just getting into letterpressing. One of my friends took the class I'm enrolled in this semester last year and he made the most awesome, detailed, heart warming gifts for his family and close friends. Being with him as he made these gifts made realize the power a handcrafted letterpressed creation can have on a person. I run an art blog that focuses on peoples' perceptions of art and over the holidays so many awesome people gave me there time to sit, chat, and help me out with my project. I want to to start making gifts of thank you for helping me out so much. I tweeted! This book looks lovely! Hi- what a great giveaway! My love of letterpress comes from my love of stationery & correspondence. I have a small etsy store and sell greeting cards. My sister gave me a present of a letterpress course in Kingston ON in 2011. We both got hooked. In April 2012 I took a plunge and got a tabletop letterpress. I am at the beginner stage but I am excited for the potential. Having a current how-to'book would be a great reference. And letterpress has a special family connection as great uncles and my grandfather used to be in the newspaper business where letterpress was the only method of producing newspapers. I adore letterpress printing. I kind of wish it was my job. I am studying to be a graphic designer and this would be an awesome addition to my skills! Hoping to expand my etsy business (http://www.etsy.com/shop/styledbykristen) this year with letter press prints. Would love this book! I live in Two Rivers Wi. The Hamilton Wood type museum is in my town. They devloped wood type printing.They have people come from all over to visit and print all sorts of things. Great vacation town. I'm a print designer with a giggly nerdy love for beautiful print (and beautiful books). Owning this book, and fawning all over its pages would make me deliriously happy (yep, my nerdy love is that extreme). Gah! I would give this book to my daughter who is a graphic design major and intensely interested in all things letterpress! Thanks so much for the chance to win! I grew up eagerly helping my dad in his basement print shop on weekends. I loved the smell of printers ink, loved to put the lead type back into the case using a cheat sheet as a guide to help me find the proper home of each letter, loved pulling the handle on the pilot press to make book marks and when I got older, actually learning how to feed paper into the C&P 10X15 as it ran. So many great memories that I now have a C&P 8X12 of my own. I don't live close to my dad unfortunately, and usually have to call and ask for advice over the phone. I still have so much to learn, and this book looks like the perfect tool for me! Would love to win a copy! Thanks for the opportunity! I was just saying today that I wish I could have done my uncle's letterpress invitations. This would help make a dream come true! Yay! I would love to have this so I could learn to make custom prints for my daughters! Plus I know where I can get my hands on some letters! I always wanted to take a letterpress class in college, but they didn't offer one. I'd just love to get my hands on this! lovely! Creating lovely script and sending letters via snail mail is one of my passions. I'd love to apply Jessica's letterpress lessons to my christmas 2012 thank you notes that still remain unwritten. Jessica's letterpress techniques and my collection of vintage stationary would be the most perfect marriage! My daughter is getting married this summer and would like a letterpress invite. This book could help us do that. Thanks for the opportunity! Blessings! 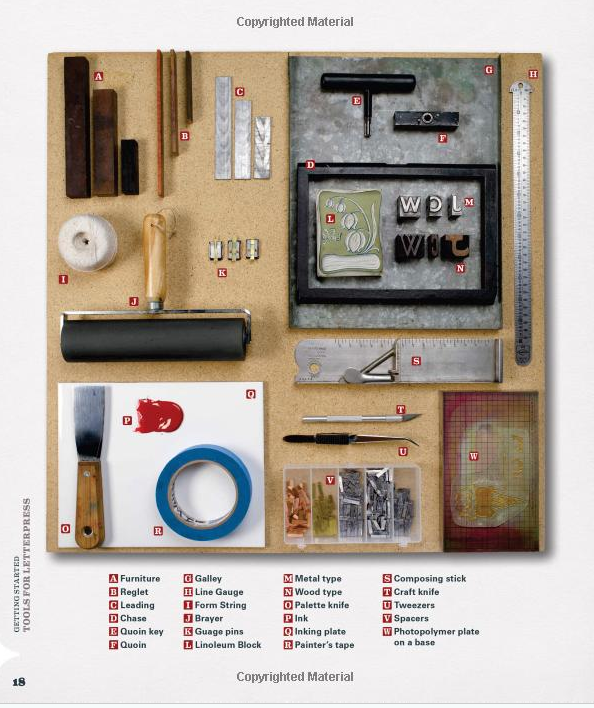 I'm just about to take a letterpress class - this would be awesome! The book can make the reader more motivated by it. I am such a fan of letterpress and especially Hatch - they are king! Would LOVE to get my hands on this! As a new owner of a 1950's windmill letterpress I'd love to get my hands on this book to help fill in the missing pieces as I learn. Great book! Love to read it. Loved seeing your post today and would LOVE that book...I'm making a wish and crossing my fingers! I'd love to win this book because I just discovered LetterMpress for the iPad and it has rekindled a love for letterpress. I'd love to really know HOW to use the furniture, the art, and the press itself. i love letterpress! It's too bad not too many people like to do it, but it's such an individual way to express a super cool artform. I'd love to win this book too! Ever since my sister's boyfriend said he had a press in his barn, I've been trying to find a way to hint that I'd love to get my hands on it. If I had this book, I could a) learn some lingo and work it into conversation or b) leave it on the table the next time I'm visiting. And, just today, while watching a video about the development of communication systems in the world, I thought it wold be fun to do some sort of printing project with my students, so printing/letterpress has been on my mind! A DIY book is exactly what I need at this moment in my creative life as I and friend are in the process of working on our first collection for an Esty store and/or craft show. Over a five year span in the '90s, we had success at having one-evening pop-up sales with friends, all of whom like us, have made beautiful things that we've hardly seen elsewhere. This is why a book like Letterpress Now would be great to have as I am on the precipice of deciding whether to buy one of the newer desktop presses being sold to crafting folks or to just return to a studio that owns the big mothers....and also I just continue to love all things printed "by hand". Thanks for considering and having the contest! I have been wanting to learn the art of letterpress for years and years, but have never had the opportunity to take a course as I live in a small town. This book could help me start an art that I adore! I'd LOVE to win this! A friend who makes bridal stationary actually has an old press. We live in different countries, but she's promised to show me how it works one day. I'd love to read this and actually understand how it works so I can partake in the pressing fun the next time I see her.